Last month I decided to try an experiment with my nasturium 'spitfire' seeds I am growing for the GROW project. I recycled plastic water bottles into miniature greenhouses or cloches. If you want to see how I did it, click here. One month later this is how they look. They have been growing like gangbusters. I actually had to make a bigger "greenhouse" for them, since the leaves were starting to touch the sides of the original "greenhouse" I had made (as you can see from white spots on the leaves). Tonight I think I am going to force my husband to drink a 2 liter bottle of soda, just so I can have a bigger "greenhouse". During the day here in Wisconsin, it can be anywhere from 40-70 degree, and at night lately it can drop as low as the 30's. Here in my area of Wisconsin it's usually safe to start planting annuals and other tender plants after Mother's Day weekend. However, in the past I have had to run out in the middle of the night and cover plants that are susceptible to frost. So the time isn't quite right yet to plant the rest of my seeds. I have started taking the "greenhouse" off my plants during the day to harden them off, and am hoping to take it off completely by the end of this week. I had also planted some tomato seeds last month using this method, and they aren't growing as fast as the nasturtiums but they are growing. I'm growing Nasturtium "Spitfire" for the GROW project. Thanks, to Renee's Garden for the seeds. 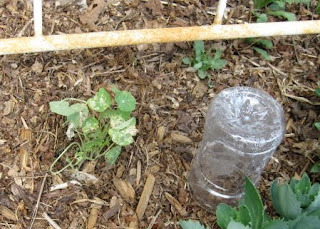 Mine really liked the pop bottle cloches, too, but today, after posting, I noticed that the evil furfaces have eaten one entire one, and most of the leaves off the other. I guess they like the peppery flavor too. Never had this problem with nasturtiums before. I have something eating all of my lilies, so I think it's deer. Rabbits usually leave them alone, unless they are really hungry. The good thing is that the deer only come in during spring, and then they are gone for the rest of the year.